USED Sony CFD-980 Sports Series CD/Radio/Cassette Recorder​. 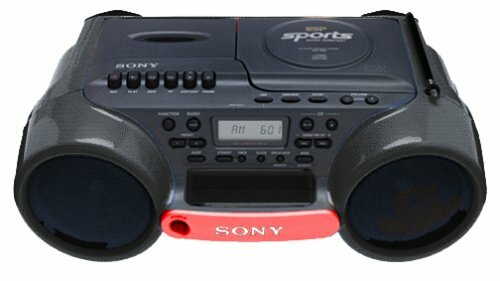 * Sony CFD-980 is a Sports Series CD/Radio/Cassette Recorder. * Rugged Splash Resistant case of high-impact plastic is designed for outdoor fun, with rubber gaskets, bushings, and waterproof seals that help keep out water, moisture, and dirt, and an easy-carry handle. * Built-in compact disc player provides digital sound with virtually no distortion, approaching the impact of a live concert. * 10 Second Electronic Shock Protection (ESP) retains up to 10 seconds of music in memory for smooth, uninterrupted playback even if the player is bumped or jarred. * 20 track RMS programming can pre-program up to 20 tracks on a compact disc, to play in any order. * Automatic Music Sensor (AMS) System on CD player lets you skip forward to the beginning of the next track, or backward to replay the same track, at the touch of a button. * Stereo cassette deck provides direct recording from the AM/FM Stereo tuner or the CD player, and lets you play back your own cassettes in addition to pre-recorded tapes.